The Mandela Foundation, which guards the legacy of freedom leader Nelson Mandela in South Africa, has officially turned against his successor, Jacob Zuma. In a statement, the foundation called on the governing party, the African National Congress, to change its leadership. “We have seen a weakening of critical institutions…due to political meddling for private interests. We are reaping the results of a political trend of personalizing matters of state around a single individual leader. This in a constitutional democracy is to be deplored,” the statement read. The narrative of African leaders who monopolize their states is a familiar one by now; the presidents of Zimbabwe, Angola, Chad, Eritrea, Uganda, and Cameroon have all been in power for over 20 years. But a crisis of leadership in South Africa, and especially in the ANC, is problematic in a unique and lasting way, even with regular democratic leadership transitions. The moral legacy of the party is welded to its mandate to govern by the example it set for the world with the Truth & Reconciliation Commission, led by the party’s most famous president, Nelson Mandela. 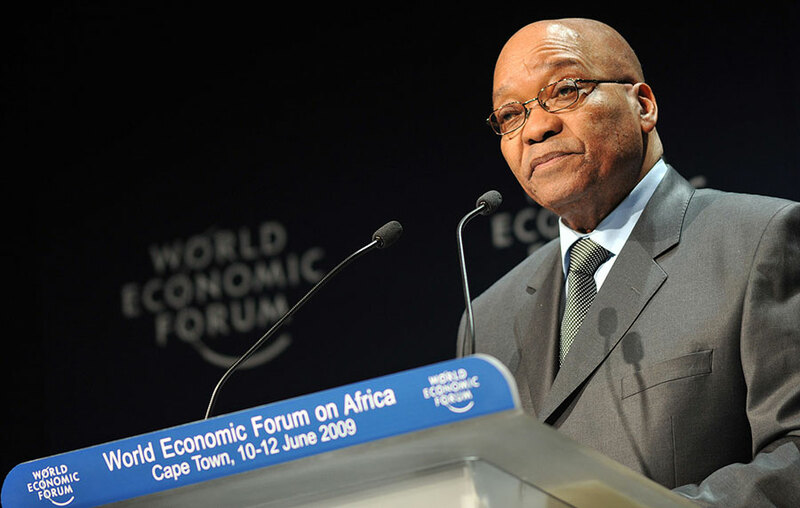 Zuma has faced censure for several incidents during his presidency. In the spring of 2016, he was ordered to repay some of the $16M in government money he spent on a lavish private residence in Nkandla. Around the same time, he managed to survive impeachment proceedings and a vote of no confidence from Parliament, thanks largely to the ANC’s majority. In October 2016, he was widely suspected of maneuvering to oust Finance Minister Pravin Gordhan, who was “a vocal opponent of corruption and excessive spending by President Jacob Zuma’s government.” The ANC stated its firm support of Gordhan and of the eventual decision to drop the charges against him. The problems with Zuma’s conduct are not limited to his presidency. In 2005, then-president Thabo Mbeki removed him as deputy president because of corruption charges, setting off years of investigations and appeals. In 2016, the High Court declared that Zuma should face 783 counts of alleged corruption, fraud, and racketeering, going all the way back to his pre-presidency career. South Africa has struggled to realize the promises of the post-apartheid era. The 20-year anniversary of Mandela’s election as the first black president passed in 2014, and many people have grown frustrated by continued educational and economic inequality. White incomes are still about six times higher than black ones. Angry university students protested this fall against the rise in school fees, until Zuma was forced to promise a freeze. Other students protested hair and language bans, calling them a holdover from the country’s racist past. Some South Africans have lost confidence in the ANC in recent years; the party has been in power since the end of apartheid in 1994. For many black South Africans, the ANC has not gone far enough in reversing inequalities, and they are dissatisfied with its moderate attitude toward policies like land redistribution. This chance to stand out against a failed president could be an opportunity for the ANC to regain its position of moral leadership without veering toward radical policies. The Mandela Foundation is not the only one calling for Zuma’s removal. A campaign called Save South Africa has won the support of the Anglican Church, Lawyers for Human Rights, Section 27, and other influential groups. Nelson Mandela’s widow, Winnie Mandela, once a Zuma supporter, has also called for him to step down. This would not be the first time that the ANC has turned against its leader; Thabo Mbeki resigned at the ANC’s urging in 2008, after allegations that he had unlawfully tried to prevent the accession of Jacob Zuma. They have another strong candidate in Deputy President Cyril Ramphosa, who served as secretary general of the ANC under Mandela and is supported by many of those calling for Zuma’s removal. The potential clash between the remaining guardians of Mandela’s legacy—the foundation he created and the party he led—indicates the extreme difficulty of maintaining both principles and power in the realpolitik of democratic government. The struggle between a party and a rogue leader is not unfamiliar in other parts of the world, nor is the difficulty in reckoning with a legacy of racial hatred. The ANC has summoned the Mandela Foundation to party headquarters but has not publicly responded to the Foundation’s statement.